We are a family owned and run business based in Cambridge UK, we sell a range of personalised quality products. For example our name labels are handmade and thanks to our bespoke production process we can confidently say that our labels will not fade and outlast the clothes they're attached to, our name label range is available in many different satin ribbon colors along with a choice of 50+ motifs, 20+ print colours and 10+ fonts which allow you to create truly personalised and unique sew in clothes name labels. 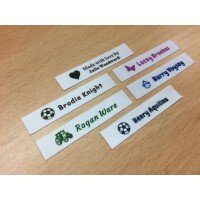 Whether you need name labels for either school/nursery children or a family member is in a care home, we've got you covered as our labels can personalised to your exact requirements making them ideal for back to school and much more. 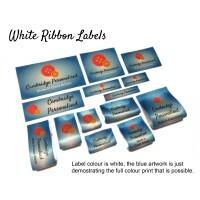 If you need labels for your business, craft or handmade items etc we can also supply those for you in a range of bespoke designs and ribbons, you can have your own logo printed in full colour (supplied by you). Please contact us to find out more. All our engraving is carried out on a jewelers engraving machine that ensures a quality of engraving that is second to none. We only use the highest quality products. Speedy service. Excellent seller. Thank you. Very pleased. Definitely A* seller. Delivered so quick, high quality and really quick and helpful customer service. As you can see we have some truly great customers and feedback, so you can be confident when purchasing items with us. We aim to ship all items ordered before 15:00 or 3pm the same day via 1st class Royal mail in secure safe packaging. If you have any questions please contact us at [email protected] or give us a call on 01223 944 002 and we will be happy to help you. If you have a logo and would like us to print it, please attach it in an email to us.